Justin Amash’s NSA amendment almost passed: Congressional critics think they could make the spy agency give up some of its powers. Congressional critics have a quiet, ad hoc strategy for making the spy agency walk back some of its powers. 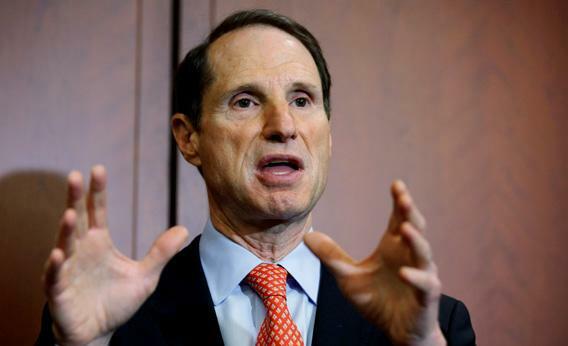 Sen. Ron Wyden (D-Ore.) has been working to reduce the NSA’s domestic spying powers. For a few minutes on Wednesday afternoon, Rep. Justin Amash thought he might have killed the National Security Agency’s metadata collection program. He’d optimistically expected maybe 90 Republicans to back his amendment to the Department of Defense budget. Ninety-four of them did. But he ran out of votes eventually—the Democrats didn’t come through—and by a 217–205 margin, the House killed his amendment. Awesome, even though they lost? Neither party’s leadership, Republicans or Democrats, is particularly invested in challenging the NSA. Rep. Darrell Issa’s House Oversight Committee has held multiple hearings this year on the 2011 attack in Benghazi and on the IRS’s pokey approval of Tea Party tax-exemption applications, but nothing on the metadata scandal that composes the rest of the “Obama administration in tatters” narrative. Senate Democrats are holding a hearing next week on the NSA program, but that’s the point—the hearing is only next week, many news cycles since Edward Snowden arrived in the Moscow airport. The NSA’s critics, from the libertarian right to the civil rights left, can’t depend on unified action in Congress. They need to poke holes in the national security consensus. They won’t get a new Church Committee, but they can put enough heat on the administration that it changes its standards. That’s what they liked about Amash’s amendment. At the time, the lack of quick action on those bills suggested that the Snowden story had been a blip. Privacy advocates in Congress now refer to those bills as the first wave, part of a strategy of attrition that will make the current policy politically untenable. Amash proved the NSA will have to concede some ground when his amendment moved quickly from obscurity to reality to being under attack from the administration. On Monday night, before the Rules Committee voted on which amendments to bring up, Amash was told to meet with Speaker of the House John Boehner on the floor. He returned from that meeting convinced (and surprised) that he’d get a vote after all. That all happened before 8 p.m on Monday. At 9:20 p.m., House Republicans received this email from the House Intelligence Committee. This meeting will be given at a Top Secret/SCI level and will be strictly Members-Only. Note from the Committee: In advance of anticipated action on amendments to the DoD Appropriations bill, Chairman Mike Rogers of the House Intelligence Committee invites your Member to attend a question and answer session with General Keith B. Alexander of the National Security Agency. Wyden’s little joke was loaded. After next week, members will spend a month in their districts. The NSA’s critics expect the issues they work on to smolder through August, right in time for a “second wave” of bills. California Rep. Adam Schiff, a Democrat, is ready with a bill that would create a “public advocate” for the FISA court, someone who’d argue for the public when the court was asked for a warrant. Vermont Sen. Pat Leahy, chairman of the Judiciary Committee, has readied a bill to move up the “sunset” of FISA reauthorization from December 2017 to June 2015. There’s no grand strategy for passing these bills. But there’s no grand strategy for stopping them. There’s something quite panicky and ad hoc, something that Amash, Wyden, and 200 other odd members of Congress are no longer moved by.